HAWTHORNE, CA--(Marketwired - Nov 5, 2013) - Be here and now to experience The Terraces at ThreeSixty. The Model Grand Opening of this landmark neighborhood by William Lyon Homes is happening this Saturday, November 9th and prospective buyers are invited to be among the first to take a look at new homes unlike anything else in the South Bay. Explore visionary single-family designs inspired by Art Deco and Classical Modern architecture that include private exterior yards and stunning third-level terraces. The Model Grand Opening is a once-in-a-lifetime event and The Terraces is such a remarkable opportunity, homebuyers cannot afford to miss it. "The Terraces models open at 10 a.m. and there will be a Free Gift to the first guests*. During the opening celebration, visitors can tour the four stunningly decorated and furnished model homes to experience a South Bay neighborhood that is moving modern architecture to the next level. Taking its inspiration from the clean lines and open spaces of classic design and incorporating the indoor/outdoor living areas contemporary buyers demand, The Terraces is poised to captivate buyers at first glance," said Lesley Pennington, Vice President of Sales for William Lyon Homes. "Well-suited for a range of lifestyles and priorities, the floorplans offer up to four large bedrooms along with grand third-level bonus rooms that are great spaces to play games or casually socialize. The adjoining private exterior deck terraces add another outdoor dimension to these homes, while the inclusion of private exterior side and rear yards offer opportunities for al fresco dining in the backdrop of a coastal-close location." "There has been incredible interest leading up to model debut of The Terraces and we anticipate a fantastic response from homebuyers eager to tour this groundbreaking neighborhood. For those who love modern architecture and a South Bay lifestyle, this Saturday's Grand Opening is the only place to be," Pennington added. Priced from the mid $700,000 and innovatively planned to embrace form, function and style, designs at The Terraces are architecturally spectacular and beautifully livable. Five floorplan choices range from approximately 1,716 to 2,508 square feet, with 2 to 4 bedrooms, 2.5 to 3.5 bathrooms and 2-car attached side-by-side direct access garages. Homebuyers will also enjoy comfortable secondary bedrooms and second-level laundry rooms. Register on the interest list at www.lyonhomes.com/the-terraces for future updates. Gated ThreeSixty, the South Bay's best-selling community is home to 300+ homeowners and offers a variety of attached neighborhoods, including The Townes, The Flats, The Row and The Lofts. Discover ThreeSixty by taking a tour of the individual model homes or log onto www.360southbay.com and Like ThreeSixty on Facebook. Private recreational amenities at The Center include a resort-style swimming pool, four-lane lap pool, spa and cabanas enveloped by swaying palm trees, as well as basketball, paddle tennis and bocce ball courts. There is also a billiards lounge and bar, wine room, outdoor entertainment area with barbeques and fireplace, state-of-the-art gym, and a multi-purpose room. ThreeSixty is located within the Westside area of the I-405 off El Segundo Boulevard in the city of Hawthorne. This prime LA address is near Manhattan Beach Pier, Hermosa Beach and Marina del Rey; retail destinations include Manhattan Village and The Grove. ThreeSixty is within walking distance of the Metro Green Line and near LAX. Homeowners at The Terraces will be pleased to learn the neighborhood is within the boundaries of the high performing Wiseburn School District. Students are guaranteed enrollment at Da Vinci Design, Da Vinci Science and the new Da Vinci Communications Academy, both independent public charter high schools. ThreeSixty residents also are guaranteed admission at Wiseburn's kindergarten through eighth grade schools, and a preference to attend the Da Vinci Innovation Academy, a new approach to K-8 education that combines school-site instruction with home-based learning. For more information, visit www.davincischools.org and www.wiseburn.k12.ca.us. At the 2013 Eliant Homebuyers' Choice Awards, William Lyon Homes was honored with 20 awards, more than any other builder at this event, in a diversity of top categories ranging from overall construction quality to an impressive selection of designs and amenities. Eliant is a leading provider of consumer research who surveyed more than 76,500 homeowners regarding their experiences with 148 major homebuilders across the U.S. and Canada. *Limited to one per family. Bay is open daily from 10 a.m. to 5 p.m. For more information, call 310-727-0762. 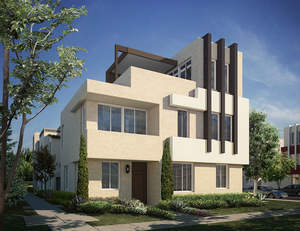 This Saturday, Nov. 9th, William Lyon Homes celebrates the Model Grand Opening of The Terraces at gated ThreeSixty.